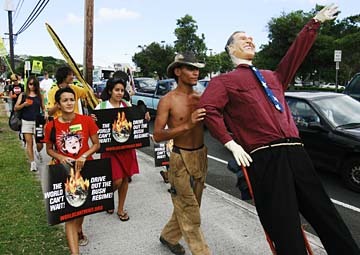 Led by an effigy of President Bush, protesters against the Iraq war made their way along Dole street yesterday afternoon. U.S. House Reps. Neil Abercrombie and John Murtha say President Bush will have to mobilize all members of the Army National Guard and Army Reserve -- including 3,000 Hawaii citizen soldiers -- for an indefinite period. There are not enough active-duty military to handle the current level of violence in Iraq, the two Democrats said yesterday. That would affect Army National Guard units like Hawaii's 29th Brigade Combat Team, which currently is not supposed to be mobilized for six years since returning from Iraq this year. Soldiers of the Pacific Army Reserve's 100th Battalion/442nd Infantry also hope for a reprieve of five years under current Army regulations. But Abercrombie told reporters in Honolulu that President Bush can invoke such drastic mobilization only after initiating "a crash program" in spending more money on Army and Marine Corps vehicles and armaments because of severe shortages of equipment, personnel and training. Abercrombie, the ranking member of the House Armed Services Subcommittee on Tactical Air and Land Forces, was joined via videoconference by Murtha, ranking member of the House Appropriations Subcommittee. 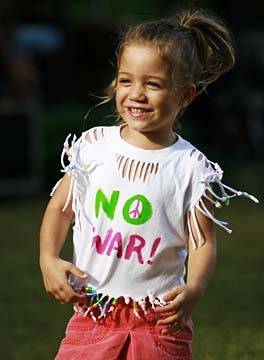 Murtha participated in the conference from his district office in Johnstown, Pa.
Lilinoe Field Perkins, 3, ran around Thomas Square during "The World Can't Wait, Get Bush Out" rally at the end of the march. Hawaii's event was one of more than 200 nationwide protesting Bush's policies ranging from the war in Iraq to global warming. Murtha, who made headlines when he became one of the first retired military officers to call for a withdrawal of troops from Iraq, said, "We can't sustain this long-term deployment." "Our presence in Iraq has increased terrorism," diverted attention from the overall war on terrorism and hurt U.S. homeland security efforts, he said. "The only solution is to redeploy from Iraq ... and get our troops away from harm's way." Murtha is a 16-term congressman who spent 37 years in the Marine Corps, retiring as a colonel in 1990. He served in Vietnam and earned two Purple Hearts, a Bronze Star and the Vietnam Cross of Gallantry. For the past year he has criticized the war in Iraq and repeatedly called for the immediate withdrawal of U.S. troops. Abercrombie said the National Guard has only one-third of its authorized equipment, and only a handful of active-duty Army and Marine Corps units on the mainland are fully combat-ready. Hawaii's 29th Brigade Combat Team, which returned home this spring after nearly a year in Iraq, left 70 percent of its Humvees and other vehicles in Iraq, and its leaders do not expect to get replacements for a couple of years. Both Murtha and Abercrombie made reference to the $23 billion in emergency money for the Army and Marine Corps that had to be approved this year to fix or replace equipment. The money -- $5.7 billion for the Marines and $17.1 million for the Army -- is in the defense appropriations bill passed by Congress last week and signed by President Bush last Friday. The $23 billion is in addition to $50 billion already set aside to cover war-related costs from Oct. 1 until early next year. Murtha and Abercrombie also said Defense Secretary Donald Rumsfeld has to go because it is impossible to change defense policy without changing its leadership.